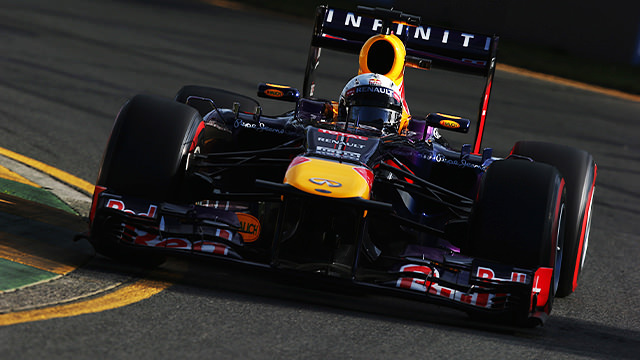 Sebastian Vettel picked up exactly where he left off in 2012, leading the way in morning practice at Albert Park. Behind him, two Ferraris and then Lewis Hamilton in the Mercedes. It was a quiet session, completed under blue skies, with drivers waiting for others to clear up the track before they went out. The Marussia drivers completed the most laps, whilst the main incident came from Paul di Resta who spun off into the gravel, but continued on. Vettel continued to find pace in the second session, beating teammate Mark Webber to the top spot in the afternoon. The two traded fastest laps in the morning, although Webber also managed a spin that saw him flying off track. Nico Rosberg was third, with the two Lotus drivers behind, but many of the runners struggled with tyre degradation as they completed longer runs. Both Mercedes drivers struggled, Hamilton spinning off track and Rosberg stopping with a gearbox issue.